Over the past fifty years, Mad Magazine has used references to and images of the Marxes many times. I have gone over every issue from the beginning through December 1998 and found about 35 of these and have included them in a feature I like to call Mad Marxness. Read Kathy Biehl's interview with Simon Louvish to find out about this novelist and biographer and his latest book, Monkey Business: The Lives and Legends of The Marx Brothers, widely regarded as one of the greatest books ever written about the Marxes. "Julius 'Groucho' Marx was the most famous of the Marx Brothers comedy team and eventually wound up with his own television show. Groucho has now moved into the cyber age with his presence on a pad woven within the integrated circuitry of the Silicon Graphics MIPS R12000. This microprocessor chip bears the greatest number of silicon creatures (six) that we have ever found on a single chip. The wireframe rendition of Groucho is about 100 microns high." 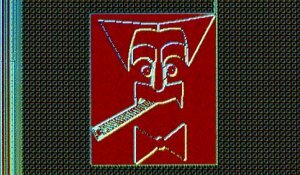 "We found this unusual character smoking a cigar on the Weitek P-9000 graphics accelerator chip used to power many video cards in the early 1990s. 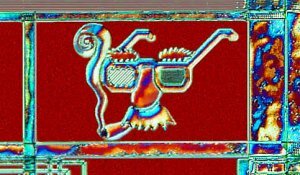 This particular chip was cut from a dysfunctional Diamond Viper VLB video card with 8 MB of RAM. The card was labeled "Fastest video on planet Earth" by Dell in a 1993 marketing campaign aimed at selling high-end 486 local bus computers. We don't understand the significance of this guy with a bushy mustache and eyebrows, but it appears that he is wearing polarizing sunglasses (that may be 3D glasses to enhance video) and the whole thing strongly resembles a Groucho mask." The books listed in this Marx Brothers Bibliography represent only a small portion of what has been written about The Marx Brothers. These are the books that were used as reference material in the creation of this site. On May 29, 1997, George Fenneman died. Fans of the Marx Brothers will all remember Fenneman as the announcer on Groucho's program, You Bet Your Life. Groucho considered Fenneman to be his greatest foil since Margaret Dumont and the two remained close friends until Groucho's death in 1977. I have posted copies of two of Fenneman's obituaries to this site -- one from The New York Times and one from Associated Press (thanks to Jonathan Jacobs and Christine L. Taylor, respectively, for forwarding these articles). To read these obituaries, point your browser to George Fenneman -- 1919-1997. ...is over, and the results are in! If you entered and want to see how you did, or even if you didn't enter but you'd still like to see the answers and the winners, click on "Why A Duck? Contest Results. In June of 2000, we held a contest to decide the best Marx-related haiku that could be produced by members of The Duck List. Here are the results. ...is also over. But I attended and took a bunch of pictures, some of which are available for your enjoyment. The Marxes were honored with a lifetime achievement award, we were treated to a strange comedy show, and I (for one) had a great time. Check out the pix and what I have to say about the whole experience by paying a visit to The 13th Annual Ocean City DooDah Parade. If you want to know what the experts and just plain folks have to say about this site, check out Kudos -- A Little Dab'll Do Ya.